Pasha Cada was not the original name, it came later around mid-1973, the time Don Lowry rejected the game as it was too expensive to produce. Also, there is a "results" section to the Chainmail table but it is built into the single attack roll and the return attack roll by opponents. The results are: exceed matrix number = opponent killed, equal to matrix number = opponent moves back 1 move, under matrix number = no effect. Further, on a no effect result opponent or defender may withdraw. There is also a sub-system for this under wizard's lightning bolt or fire ball and saving throws for monsters that can result in killed, "back 1 move", "routs off board", and "no effect". Of course, both Strategos and Chainmail assume an animus force opposing and counter attacking, i.e, the other player. Dungeon! does not have an opposing player (normally) and thus, there is system to auto-determine what effect the monster has. I think the monster vs. hero attack-counter attack system is clearly more similar in Chainmail and D&D than Dungeon! Just because there is one table in Chainmail does not mean there are not two "weights" with one favoring heros over monsters. However, even stating there is any sort of advantageous vs. disadvantageous nature of the D&D tables seems disingenuous. They are simply weighted by the relative power of creature or hero. There is no advantage for a 1st level character if facing an ogre or troll. Indeed, even a 4th level fighter in chain mail vs. a 4+1 HD ogre is at a disdavantage as the ogre needs a 9 to hit and the fighter hero needs a 12. In Chainmail they need a 9 and a 10 respectively. I agree the Strategos seems a likely influence but we *know* Chainmail was. To discount or minimize the similarities in a known influence over and emphasize the similarities of uncertain one seems to unnecessarily favor your posited theory. That's a terrifically thoughtful response. Thanks for taking the time, and thanks for the note about Pasha Cada. I'll reword that more accurately to reflect what you said. I did speak to David Megarry about it and according to him, prior to sending his prototype to Don Lowry, the game didn't have an official name. It is definitely interesting to consider the influence of the CHAINMAIL on Dungeon; influence which is certainly there in a number of facets (including monster TN's - but that's fodder for another post). However, to be honest, I don't think there is much to commend links drawn between the Combat Losing Table of Dungeon and the Fantasy Combat table of CM, if that is what you are suggesting. In regards to the CM Fantasy table roll results you mentioned, It is a simple and common rule of Win-Loose-or Draw with losing equating to death and the rare draw equating to the losers movement distance retreat in inches. Clearly, this FCT results rule bears no correlation whatever to the organization of the CLT schema nor do any of their individual components match, except that both assign some possibility of death. The same point can be made in regards to the CHAINMAIL post melee morale table. So, I can't agree that I've minimized CM's role in the CLT. On the contrary and with all due respect, there is no there there. Likewise, the connection between Strategos table T and the CLT is in no way uncertain. 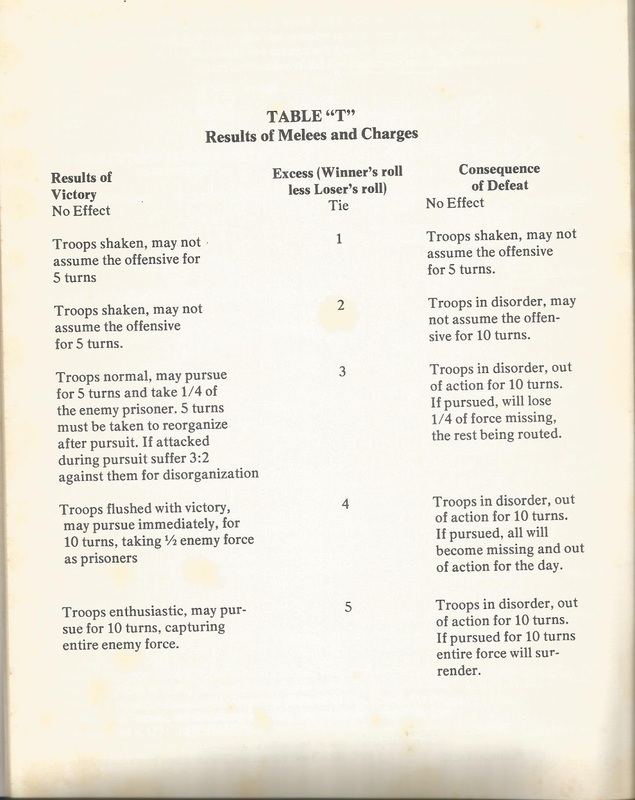 It is directly apparent just in physical comparison, that the Combat Losing Table shares the exact organization and stratigraphy of the Combat Losing column of Strategos table T. Indeed the Combat Losing Table of Dungeon!, like the DgutS table, is a Combat Losing column of Table T. There is no meaningful distinction. However I totally agree that " the monster vs. hero attack-counter attack system is clearly more similar in Chainmail and D&D than Dungeon! ", if I understand what you mean correctly. Meaning both CM and D&D rely on a single method applied to a TN on a similar matrix. Dungeon is certainly different in that respect. I think where we would part company is if you are suggesting that there is a difference in the attack protocol applied to monsters from the protocol used by hero's and superheroes in CM. Your point regarding the CM FCT being potentially skewed in favor of hero's and superheroes is well taken. It is possible for that sort of bias to be embedded within a single matrix, but if it is, it is far from obvious in the case of the FCT. I'm not sure how a hidden bias of this sort could be an influence on the split we see in D&D of two entirely separate tables. So I'm talking about a split in sub-system mechanics that exists in Dungeon! and D&D but not in CM. CM does not offer a separate, unequal table for "players" in the attack protocol. Both D&D and Dungeon! do. D&D gives a Monster Attacking Table and a Men Attacking table. However, you are quite right to point out that D&D, unlike Dungeon! and probably early Blackmoor, disfavors the player (I'll edit the blog above to reflect your point). For example, a 3 HD monster attacking an unarmored human needs only an 8 to hit AC 9 on the Monster Attacking table, whereas a 3rd level player needs a 10 on the Men Attacking table, but there is nevertheless a clear mechanical distinction being drawn between two factions. While I don't intend to overdraw the issue, I do find these split sub-systems intriguing as a design artifact. Anyway, thanks again for the input Paul. It's always great to hear your thoughts. So could you relate what the *known* influence Chainmail had on Dungeon! ?